Supermodel Naomi Campbell reportedly got into a shoving match with model Cara Delevingne over Rihanna during Paris Fashion Week. The two models apparently got into a fight over their mutual friend Rihanna while at a chic party for Dasha Zhukova’s Garage Magazine at Paris club Castel Sunday night. A separate source said Naomi unexpectedly started ranting at Cara at the glamorous bash, with guests including Bianca Brandolini and Lauren Santo Domingo. The source said, “It was a noisy and packed party. Naomi was saying all these nonsensical things, she was ranting. There was a messy pushing match. 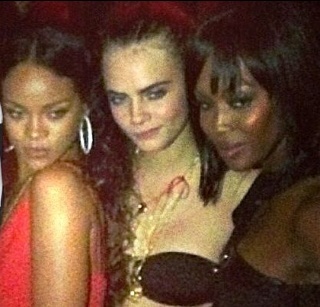 Cara didn’t understand because there’s no problem between her and Rihanna. Cara didn’t want to be involved and was telling Naomi, Get away from me!”. Naomi Campbell has since denied this.